In the book, Why We Write about Ourselves, author Sue Monk wrote that one of her biggest fears was to be disconnected from her own life story, a feeling she described as “being unmoored” from her life. I have this same fear. And maybe it’s because of my recent birthday, but lately I’ve been in a reflective mood, looking back at my life and noticing the ebb and flow of my memories. I see how certain experiences seem to emerge from the fog of my mind like a flashing neon sign, reminding me that something essential to my Being happened here; there was something about this story that nudged me toward my center. This is what I notice as I get older. My birthdays are beginning to feel like invitations into my past. Because in order to keep growing in a bold and authentic way, we have to insist on knowing ourselves from the inside out. Maya Angelou once famously said, “When people tell you who they are, believe them.” Well here’s my slight tweak on her advice. When people tell you who you are, don’t believe them. You are the sole holder of your truth, the only person who can define your boundaries, your values, and your deepest needs. Don’t let someone else’s opinion of you become your truth. Realize that everyone sees you through their own personal lens and they only see pieces of your story. Place value on knowing yourself deeply. Be unrelenting about finding your own voice, but use it with a sensitivity and wisdom that allows space for the other person’s experience too. And never let someone else define you; that job belongs to you. I remember a young woman who came to see me years ago, because she was severely bulimic. She would sit at the edge of my couch with her long, ballerina shaped body hunched into a tense ball, looking ready to spring out the door at any minute. Once when I asked her about this, she smiled and began to pick at her chewed fingernails. The whole world thought The Ballerina was a happily married woman but it wasn’t long before she told me about her passionate affair with The Other Man, someone she described as the exact opposite of her dependable husband who came home each evening with dirt under his fingernails. She worked part-time at a restaurant and The Other Man would stop by and sit at the bar, flirting and eating with her during her breaks. Over the months it had evolved into a sexual relationship, an escalating secret that had flooded her life with chaotic emotion and sent her bulimia spiraling. Still, she wouldn’t give him up. If you looked at The Ballerina’s story from the outside you would never see the layers of relevant details behind the unraveling of her life. You would never know about the fight she had with her mother that summer night before she left for camp. Or the emergency call she got in the middle of the night informing her of her mother’s sudden death. There had been no chance to mend the silly argument. No final hugs or goodbyes. And no last words between mother and first born daughter. In fact, her grief-stricken father—left alone with five kids—couldn’t bear any discussion of the shocking death of his wife, so The Ballerina was even deprived of the ability to grieve her mother in an open and healthy way. The sheer enormity of her unresolved loss stunned me. But it was these missing pieces of her story that helped me understand her early marriage to the boyfriend who once knew her mother, the fragility of her undeveloped self, and her frantic avoidance of her entire emotional world-- as the tenth anniversary of her mother’s death approached. This is what I’ve learned along the way. Most of the time it requires heroic courage to own all the parts of our story; to go to those raw, tender places inside us and sit with our feelings and memories long enough for clarity to begin. It’s not enough to treat your emotions like your pleasant neighbors across the street, to nod and smile and talk about getting together some day in the future. It’s too easy for that “someday” to be indefinitely postponed and for those flashes of your authentic self-- to never see the light of day. You cannot pick and choose what’s true; you cannot banish certain memories out of your awareness because they are painful and messy and don’t fit with some Brady Bunch narrative you’ve got in your head. Feelings that remain unclaimed and unexpressed by us, and most importantly unvalidated by another human being, become combustible emotions that are ignited under the right circumstances. We fool ourselves if we think we can run away from our truest feelings. Alice Miller’s words about happiness focus on this idea. The true opposite of depression is not happiness, she says. It’s not even the absence of pain. The opposite of unhappiness is vitality: it’s the unabashed, luxurious freedom to experience your spontaneous feelings. You have to read Miller's book Drama of a Gifted Child, to understand the kind of sensitive, high achieving people she wrote about. But basically anybody who has ever felt like they wore a mask can relate to these words. The idea that we unconsciously (or blatantly) label certain feelings as ‘negative’ or ‘bad’ was not one I ever put into words when I was young, I just lived accordingly. I smiled on the outside when I didn’t feel like it and chalked it up to, "Oh. It must just be me.” I assumed everyone else was happy and there was something different about me. This is the double whammy that goes with judging our feelings. It goes like this: not only do we feel bad about something, but then we feel bad about how we feel. And like the Ballerina, because we spend so many years disowning those raw feelings—whatever they are---we often don’t have the tools to deal with them in a healthy way. So we keep avoiding, only in the end it doesn’t work. Even if you run away from your most authentic self by losing yourself in your job and getting high on success, or by medicating with food or drugs, even distracting yourself with wildly wrong relationships. There is a dislocated pain that happens as we move farther away from our truth; we can sense it. A dull feeling of complacency that settles over our lives, days that might feel like we're simply going through the motions. These are the clues that tell you that it's time for some self exploration. Which brings me back to the idea of writing memoir. ---not just the happy stories that weave comfortably into my narrative, but I’m curious to write about those stories that contain gritty struggle and pain, even lingering questions, because these are the experiences that have shaped my core. I’m not suggesting you spill out your most painful secrets to the world. I’m talking about self-examination. You. Alone. Writing. Or even talking to the right person. The Ballerina came through my door because she no longer wanted to feel that wretched aloneness with her traumatic loss. But it doesn’t mean she was ready to dive into those dark, murky emotions that were so terrifying for her. In fact she wasn’t. But have you noticed the role of timing in your own life? If so, you already know that you can’t make someone deal with festering, unresolved feelings. Readiness is everything, when it comes to examining our lives and being open to those serendipitous aha moments. But that doesn’t mean we stop being riveted by our own lives. So here’s my birthday wish for you. Whatever stage of life you are in, carve out some quiet time to cultivate self-awareness. Slow down. Start to notice the repetitive themes that pop up in your struggles. Feelings that make you uncomfortable. And don’t be afraid to look beneath the surface. Self-awareness will save you from wasting time in a depleting job, it will help you walk away from the wrong man, and it will ultimately help you find your purpose in life. Here are a few books I keep close to me when I’m writing memoir. I hope this post inspires you to pick up one and become curious about your own life story. ps 2. Thank you all your kind wishes on my sprained foot, I hope to moving at normal speed in a few days! Hi Leslie! I know I've been absent. Just hanging with my own thoughts in June and July has turned into family time. But I'm taking some time to catch up. Glad I read this post. I need to do a trip to California so we can talk about this! Something worth discussing is dealing with the delicate balance between owning your own story, but keeping the appropriate secrets. And the issue of when others expect you to pick up their battles, carry their grudges, engage in their own bitterness - live in their story. My sister and I were discussing that this morning. Another sister is visiting today and we know we will have to deal with these issues with her. Sometimes it seems the only choice is to hold her at arms distance rather than engage in her battles. I have to find a way to let her know that I understand and support where she spend her emotional energy, but that I will make my own decision about where I spend my own. And by the way, that juicer makes me envious. Thank you ... as always inspired. The older I become I realize the importance of owning your own story and accepting what the journey has been. What a beautiful and inspirational post which is applicable to us all. We so appreciate you sharing it with us on Thoughts Of Home On Thursday. For me, with age came wisdom and an understanding of myself and fortunately, I like "me". And, if Karen of Somewhat Quirky makes that trip to California, you both need to come visit me! bird by bird. the most helpful book on writing for sure. it continues to undergird my process.when i first started writing all i wanted to do was have as much of anne's flavor as possible! i think i really connected not just with her honesty but all that crabbyness. over the years, some of my crabby has fallen away so i must adjust to writing with less edge whereas anne's just gets more interesting! I featured this post on Thoughts of Home today. I JUST HAD A BIRTHDAY! YOU are SO right here in what YOU say..............that bit about don't BELIEVE what others say about YOU! I try and make MEMORIES and YOU know what I think the MEN enjoy it even MORE then the WOMEN!!! Leslie dear, Happy Birthday beautiful! I celebrated mine on the 15th (in Paris). I've been traveling for the last month. A pursuit that is energizing to both mind and soul. I'm back, entering the entirely new realm of retirement and reinvention. I'm so happy to have caught this thoughtful post. You are a gifted writer, truly. 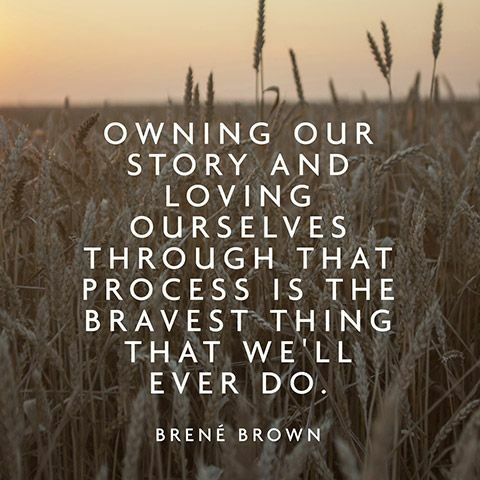 Owning our story...so essential and yet not easy. I have a story that I've wanted write since before I started my blog 4 years ago. It's about my adoption. I've been hesitant because it is not only my story, there are others involved, yet it most certainly IS my story. Thank you for this food for thought today. Is it true we may be meeting up in late August?? I would LOVE that!! Glad to hear you had a nice visit with your parents, and that you are more mobile now!